SAMPLE SOUND REVIEW: 70% off “Invasors” by Divergent Audio Group (Kontakt Player) - Limited Time Deal ! 70% off “Invasors” by Divergent Audio Group (Kontakt Player) - Limited Time Deal ! “Invasors” is an incredibly versatile analog-inspired synthesiser created for power-users, synth-heads, producers and sound-designers. 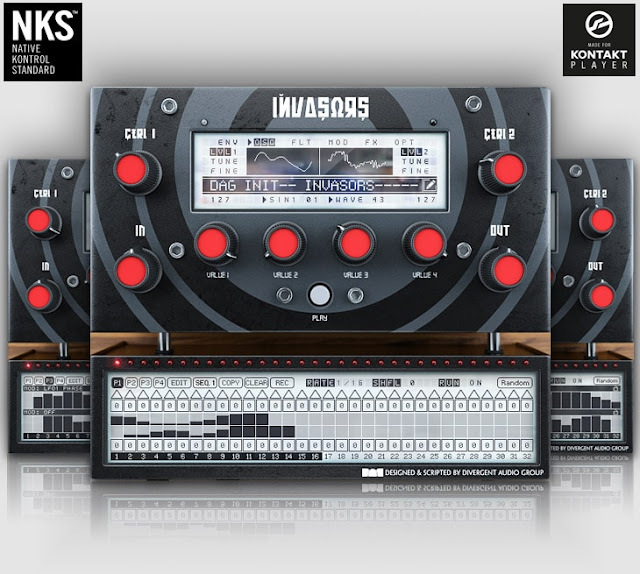 Compatible with the free Kontakt Player and NKS ready, “Invasors” is analogue-inspired synthesizer done right! “Invasors” is the perfect tool for creating gritty, distinctive leads and basses for all types of musical styles including Electronic, Pop and Underscore. Real Deep Synthesis – Create unique analog-powered patterns with the grit and warmth of a hardware synthesiser. Dynamic Sequencer – Control Glide, Pitch, Velocity, Note Length, Cutoff, Resonance, Lofi, Phaser, Flanger, Chorus and Reverb. Power And Clarity – Use just 4 controls as if you are controlling a real piece of hardware. Remote Control – Completely controllable using any external 8 knob midi controller. Seamless Integration – Easily scroll through multiple pages without ever leaving the main menu. NKS Ready – All major controls are already assigned if you have a Native Kontrol Standard keyboard. 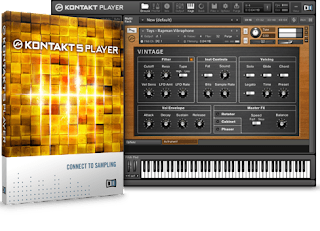 Best of all it’s completely compatible with the Free Kontakt Player, which you can download HERE! Raw to the Core – Create Gnarly Analog-driven Synth Leads & Basses With Ease! Invasors has 2 Oscillators, each with 128 unique waveforms that can be combined in a variety of exciting new ways. Invasors goes deep, very deep, allowing you to create unique analog-powered patterns that have all the grit and warmth you would expect from a hardware synthesiser. Our most advanced and dynamic sequencer allowing control over Glide, Pitch, Velocity, Note Length, Cutoff, Resonance, Lofi, Phaser, Flanger, Chorus and Reverb. It also includes advanced Randomisation modes and Trigger modes such as Latch and Retrigrigger as well as midi export for all generated patterns. 2 Oscillators – Clicking the waveform will pick a random one, for instant inspiration. Each oscillator has individual Level, Tune and Fine Tune. Four Filters – LP53, Daft, Formant, and Highpass. Can be modulated by the filter envelope or one of three LFOs available from the modulation screen. LFOs – Can run at speeds from 1 bar up to 1/32 triplets. Each LFO has a different shape that can be morphed by whatever amount you specify. Effects – Phaser, Flanger, Chorus, Lo-fi, Dynamics, Equalizer, Delay and Reverb. Unison & Voice Options + Shaper Section – Bit Depth Requantize, Resampling, Noise and Stereo Spread. Other settings – Amp and Filter velocity senstivity, Filter Retrigger, and Pitch Bend range. The seeming retro-simplicity of “Invasors” GUI design hides a truly powerhouse synth engine underneath, capable of producing gritty, gnarly analog-driven synth leads & bass sounds like no other library and will provide endless hours of inspiration for your next music project. Normally €125.99 – get it at 70% off before it’s gone! 70% off the normal price (normally €125.99)! 2 Oscillators with 128 Waveforms each. Perfect for Electronica, Pop, Underscore and much much more! This is a Really Awesome Analog synthesizer at a great deal for a limited time only at 70% Off.